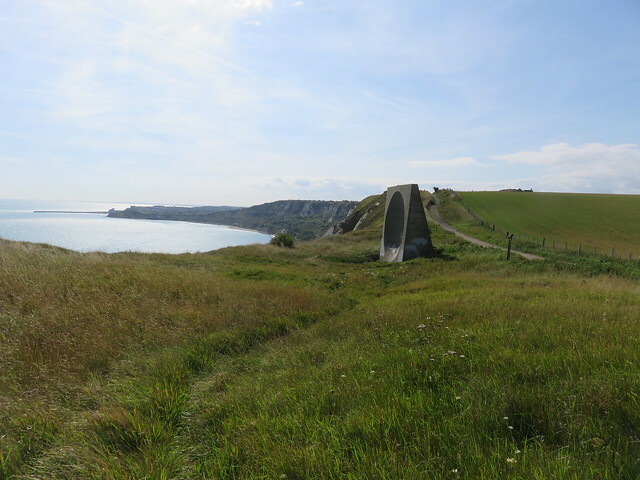 Another visit to the Abbot’s Cliff sound mirror, while walking the North Downs Way long distance footpath. 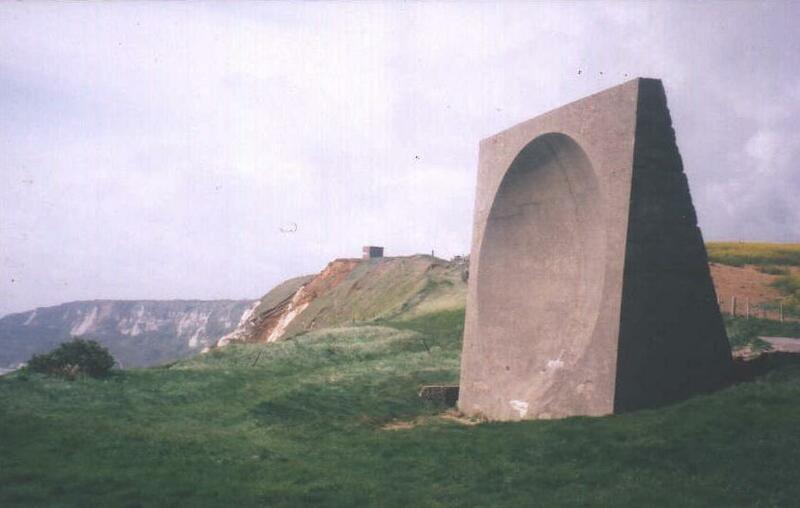 Abbot’s Cliff Sound Mirror – Strait of Dover is a picture of a “sound mirror” built during the World War II era for the purpose of amplifying the noise of approaching aircraft. […] Beam’s camera translates light and shadow into a negative, and then a print, the sound mirror takes what is unheard out of thin air and translates it to something we can hear. The old Zen question about the tree falling in the woods is meditative, but it is also scientific: If there is no one around to hear it, it definitively does not make a sound. Similarly, if there is no eye, there is no image. Source: “Robert Collier Beam: Scry” at Pump Project, The Austin Chronicle, 26 May 2017. Stuck at Dover? See a sound mirror! The mirrors’ fruitlessness may be forgiven if only because of the uncanny impression one gets that they were built for a future not yet seen or understood. Indeed, its second life as a monument and relic has been more enduring than its first. 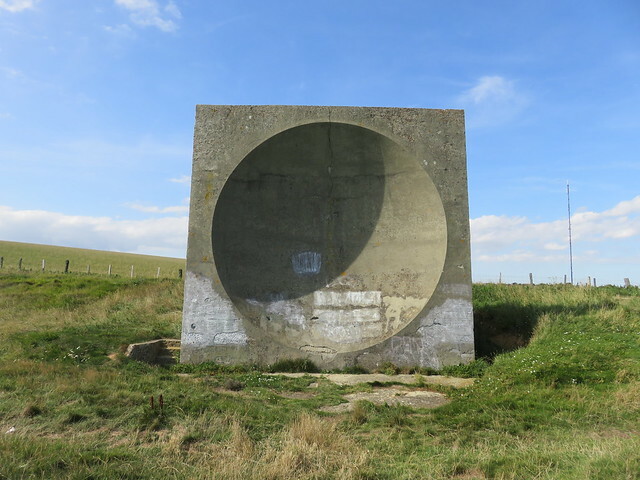 Christo Hall visits the sound mirrors on the Kent coast with photographer Stuart Leech and “finds an obscure functionalism melting into majestic land art”, in The Second Life Of Concrete: Brutalism’s Renaissance, published by The Quietus on 10 July 2016.
sound mirror (abbott's cliff, dover) from Rhi Bowen on Vimeo. 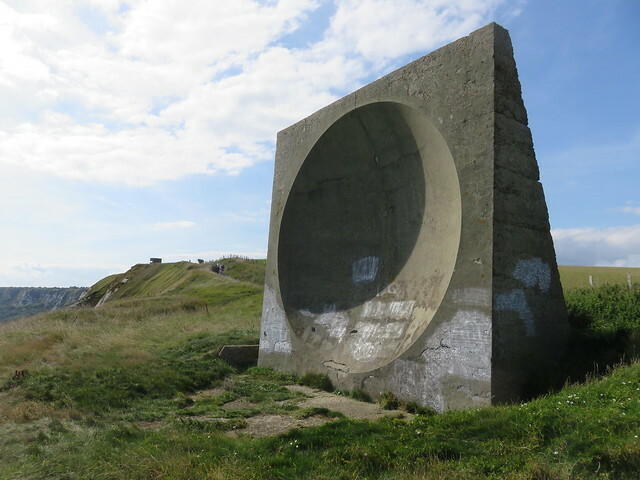 Lancashire duo Aquilo‘s EP “Human” released on 8 December 2014 features the Abbot’s Cliff sound mirror (and other locations around Folkestone) in two videos. The song is “based around the idea of a delicate relationship that was slowly coming to an end and eventually finding a solace in the fact it had ended”, according to an article at Pigeons and Planes. It’s perhaps not the most cheerful ditty, but does have a sound mirror. Last year psych-rock quartet Syd Arthur featured the Abbot’s Cliff mirror on the cover of their album, “Sound Mirror. The second album from Canterbury psych-rock quartet Syd Arthur is called Sound Mirror, and features the Abbot’s Cliff acoustic mirror on its cover. “From the tantalizing ‘Garden Of Time’ to the prophetic ‘Sink Hole,’ ‘Sound Mirror’ expands and refines Syd Arthur’s already uncommon sonic multiverse into a brave new space where focus and concision is as essential as freewheeling abstraction and genre-shattering creativity”, apparently. Sound Mirror will be released through Harvest Records on 2 June 2014. The Abbot’s Cliff sound mirror appears in the 1941 watercolour “Bombing the Channel Ports” by war artist Eric Ravilious (1903-1942). Thanks to Eddie Bromhead for letting me know about the painting.